As we work towards raising the NIH budget and improving the quality and quantity of research in this country, it’s important to think about how it can all be paid for - especially when we take into account the current health care reform proposal set to cost about $700 billion over 10 years. Given the current economic crisis, people are naturally curious about where the government is going to come up with $70 billion a year. 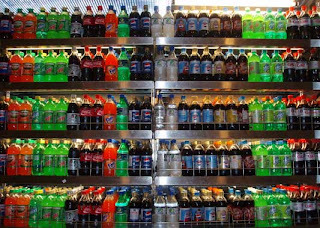 One of the most intriguing possible solutions: a soda tax. It will discourage people from drinking soda which will have a positive impact on health. The question then becomes, what does a soda tax have to look like in order to dent the health care costs? And, assuming there is a drop in consumption that corresponds to the price increase, will it help America’s ever expanding waistline? It’s helpful to compare soda with other items subject to a sin tax: cigarettes and alcohol. Cigarettes recently underwent a 150% tax increase from $0.40 to $1.01 per pack, but even at the previous tax rate, federal revenues on cigarettes came to approx $15B in 2007. That’s both a lot of money and absolutely shocking number of cigarettes (assuming 20 cigarettes a pack, that’s 750 trillion and an entirely separate health problem). Alcohol gets a tax rate that differs between beer, wine and spirits, but combined the sin tax brings in around $5B. If we use the beer tax of $0.05 as a guideline for a potential soda tax, we get some large numbers. Last year Americans consumed 10.2B cases of soda (at 24 cans in a case thats 244,800,000,000 cans). Not diet soda mind you, the incredibly sugary (and better tasting if we’re honest) soda. If we apply the beer tax of $0.05 to this, we get $12.4B in revenue or 19% of President Obama’s proposed health care initiative. This doesn’t affect diet sodas, juices or iced tea. That’s 19% of the massive health care reform taken care of being charging you an extra nickel for your coke. That's a ten percent increase on a can of soda bought in a 12-pack. In the past a 10% increase in the price of soda saw a decrease in consumption of as much as 8%. Now correlation is not causation, but it’s impossible to look at those numbers and not see that they’re linked. 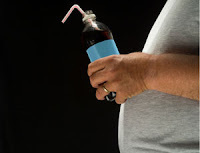 The economically disadvantaged are most at risk for obesity and part of that is they are the leading consumers of soda. Soda is often the cheapest item in the store. So, to some degree, the tax targets the economically disadvantaged. But, they stand to benefit the most from the proposed health care reform this kind of economic behavioral incentive is designed to support. As for those who think this kind of economic incentive doesn’t work, try to remember that 42% of Americans smoked in 1965. 42%. 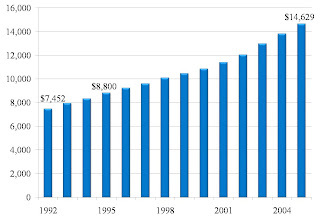 While health awareness campaigns have certainly played a role in the decline, the rising cost of cigarettes (primarily due to taxation) has significantly contributed to the decline of American smokers. We can’t begin to confront the obesity problem until we begin to confront the sources of that problem. It’s nice to encourage exercise and diet as a means of losing the weight, but the best medicine is the preventive kind. I think if we can cut soda consumption and pay for 19% of a reformed health care system, I say bring it on. Besides, I’m a juice drinker anyways. I'm moving on - to what , I don't know yet. Along the way, I've learned some lessons to live by and I thought I'd share. #1. I'll always be a scientist. "You'll always be a scientist. You may not be at the bench, but you'll always be a scientist. Never forget that." He's right. I'll never stop analyzing, asking the how? when? where? why? weighing evidence and in general seeking out answers and information. I'll always be a scientist. #2. People will surprise you. People will surprise you- with their kindness, generosity, patience and willingness to help. They will also surprise you by letting you down, disappointing you, being mean and being (seemingly) irrational. For every mentor, superior, person-I-looked-up-to who let me down, I found someone else who helped lift me up. People who (I thought) didn't know or wouldn't care found the time and the energy to be there for me. I will always be grateful for them and now I know that I will keep finding them in unexpected ways and places. #3. Its okay to not have all the answers. When I was in high school I wanted to be a zoo-keeper. I love animals and I really wanted to work in conservation. In my senior year, I took a class in genetics and I loved it. I decided to do research and pursue a Masters' in life sciences. I worked in a lab that summer, in a famous research institute. The lab was looking at the genetic basis of diseases like schizophrenia. I loved being in lab. I still remember the first time I extracted genomic DNA - no fancy kits back then, it was the ole' phenol-chloroform and the glass stick to spool the long, beautiful threads of genomic DNA. I remember calling my Mom from lab, breathless and giddy..." Guess what? I isolated DNA today." That made me decide to get my PhD. I worked in a fruit-fly lab researching embryonic development. At that time, all I wanted to do was become an academic researcher. I thought I finally knew the path, the way. I was fairly good at what I did- picking up awards and publications. I loved the work itself, so I thought I was all set. But, I found myself becoming more and more drawn to the world of policy and advocacy. It took me a long time wrestling with the idea of leaving the bench and the goal of running my own lab, before I finally made peace with it. I decided to do the policy fellowship. It has been an extremely rewarding experience and I've enjoyed every minute of it. It's okay to let life happen to you. You don't have to know exactly what you'll be doing 10-20 years from now. And that's okay too. So, dear readers, its been fun and I'm sure I'll run into you again in the blogosphere. FlyGal is stepping down as a regular blogger for New Voices after four months of insightful posts. Her last regular post will appear next Monday. We love hearing her perspective and look forward to seeing her back as a guest blogger in the future. Welcome to Part 6 in our series on Human capital and knowledge-based economy. In the past we have examined what it takes to train a scientist and how tough the competition is to become an independent researcher. The statistics look rather bleak for Dr. Cy Ence and his band of fellow researchers. So what can we do about it? Become advocates for science and scientists. Funding science (and therefore scientists) is not only about satisfying our intellectual curiosities and finding cures for diseases, today it is about having an edge in the knowledge-economy. Training and supporting the next generation of researchers ensures our capacity to continue innovating and thus continue to be a competitive economy. Research is the foundation for a better tomorrow. Investing in research ensures that we will have a better quality of life. Research will also allow us to have a healthy, strong and vibrant economic future. Learn about who is doing research in your neck of the woods. Chances are that if someone's doing health-related research, they are federally funded. Learn about important policy issues by signing up for advocacy alerts. Meet with your congressional representatives and tell them about the research going on in their districts/states. Find out who your congressional representatives are and their stances on science and health research. Write to your local news outlets (newspapers, radio, TV) - get them to pay more attention to research and researchers. Try and make sure that science and research funding is a topic that gets attention during every election cycle. Follow federal appropriations for research - it's easy to see how your state is doing. Finally- just talk to people you meet. Tell them about what you have learned. Get them to join you as an advocate for research and researchers. We hope you've enjoyed our series on Human capital and knowledge-based economy and we look forward to your comments and thoughts. This is Part 6 of 6 in our Human Capital and Knowledge-based Economy series. Welcome back to our series on Human Capital and the Knowledge-based Economy. Today we will continue examining Dr. Cy Ence's career path. Assuming Dr. Ence does get a tenure-track position at Prestigious American University, he now has to find money to run his lab. Since he is in the life sciences, he will have to do that by getting some grants funded. First, he (and/or his students) will have to collect preliminary data in support of his research hypothesis. Based on the initial results, he will have to write a research proposal and submit a grant to a funding agency. The largest funding agency in the life sciences is the National Institutes of Health (NIH). There, his grant will be reviewed by a committee of his peers and then further by a committee of professional grant managers. Then his grant will be scored and depending on his score, he may or may not get funded. Just like when he was applying for faculty positions , the numbers don't look so good for Cy. 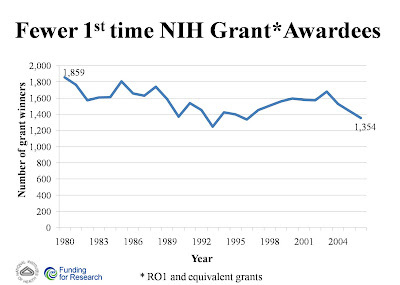 The number of first time NIH grant winners has declined from about 1,800 in 1980 to about 1,350 in 2007. One reason for this is an increasing hyper-competitive environment for grants. When Dr. Ence starts up his lab, he will be competing with established researchers who have had labs for five, ten, or 15 years and therefore 5,10 or 15 years to establish themselves as opposed to our favorite newbie Cy. They are all applying for the same pool of money, and grants are graded and scored the same way. 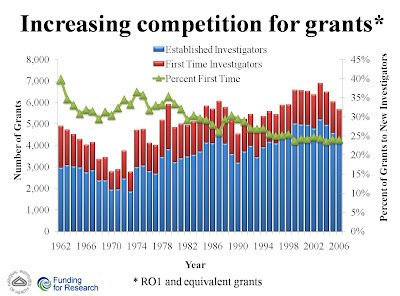 A result of this system has been a steady decline in the number of first time investigators as compared to established investigators winning grants in any given year. 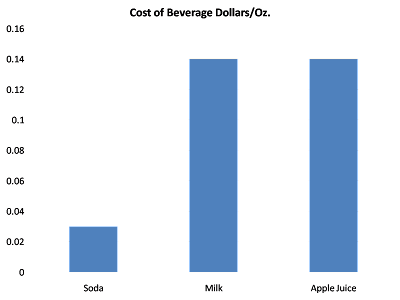 It has gone from about 40% of first time investigators being successful in the early 60's to only about 24% being successful in 2006.
they can't carry out experiments in a timely fashion, which results in few or no publications which in the worst case scenario means that they run the risk of losing their lab. The current crop of graduate students and post-docs are watching this happen around them everyday and fewer and fewer of them want to even attempt a career as faculty in academia. Basically, we are pulling the rug from underneath the feet of the next generation of academic researchers. Another consequence of this funding environment has been the reluctance of granting agencies to fund the more high-risk, high-reward projects.There is a limited pool of resources which they are responsible for distributing and are also accountable for. So, they have done what every other agency in their position would do- they have chosen to bet on the sure horse; they primarily fund more traditional, conservative science. This means that although we are making steady progress- it is progress in small steps instead of progress in leaps and bounds. So, is everything just dismal and negative? Should we just give up? On Thursday we'll wrap up this series by responding to your comments and suggesting next steps for improving the way our country invests in the future of science. Sources: National Institutes of Health (NIH)/Office of Extramural Research (OER), A broken pipeline? This is Part 5 of 6 in our Human Capital and Knowledge-based Economy series. New Voices is officially off today in remembrance of the brave men and women who lost their lives defending the United States of America. We thank all of our armed forces for serving our country and preserving our rights to life, liberty, and the pursuit of happiness. 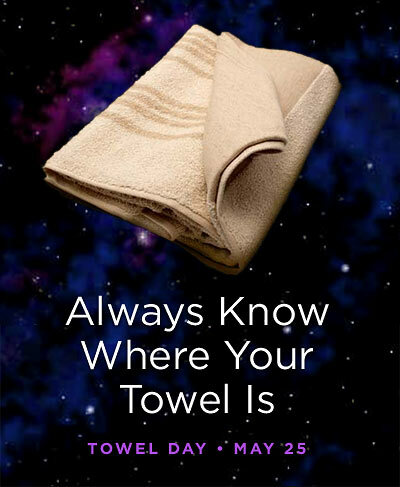 In that pursuit of happiness, we're also celebrating Towel Day. 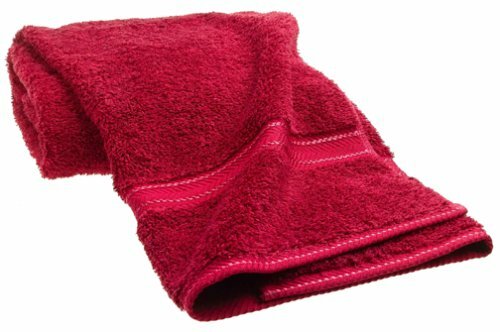 Bring your towel with you as you head out to those neighborhood picnics and barbeques and come back on Friday when we more thoroughly expand on a great science fiction theme. There's nothing more American than apple pie, baseball, picnics, and town hall meetings. Okay, so not all of those things are your first thought on an upcoming long weekend, but we're advocates, right? There's no better way to let your elected officials know what's on your mind than to actually tell them. The U.S. Congress will be on Memorial Day recess next week (Tuesday, May 26 to Friday, May 29) so many Members will be at home in their districts. Save yourself a trip to DC and make your appointment to meet with your Member today! But how do you make an appointment? Below we've outlined 5 simple steps to make an appointment with your elected official. Our model is based on meeting with Members of Congress, but the same basics are applicable whether you're trying to meet with a member of the school board or the majority leader of your state senate. If the Member is not available, accept a meeting with the appropriate staff person. Staff are influential and a great resource - meeting with them is as valuable as meeting with your elected official. When calling or emailing an office, ask for the scheduler’s name so you can address them directly. Send the meeting request per their preference. Include your complete contact information. Clearly state what issue or topic you wish to discuss, so the scheduler can direct you to the right staff member if your Member is not available. Save other background materials for your meeting. 5. Follow-up by phone and email. Meetings with Members may not be secured until a day or two before the meeting. Be flexible – every office is different! Any readers have other tips for making an appointment? Welcome to Part 4 of the Human Capital and the Knowledge-based Economy series. Last time we examined the investment needed to train a single independent researcher - Dr.Cy Ence. Today, lets look at what it will take for Dr. Ence to become an independent researcher at Amazing American University. But before that a quick re-cap: Dr. Ence is now in his late 30s. He has finished 7 years of graduate school and 9 years of post-doctoral training. He has published great articles, attended conferences and given talks. He's putting together his curriculum vitae (CV), so he can start applying for jobs as an assistant professor. What are his chances? According to a forum convened by the National Academies, the chances of a life scientist under the age of 35 getting a tenure-track position fell from 10% in 1993 to 7% in 2003; as the number of life sciences PhD graduates went from 11,000 to 16,000 and tenure-track positions held steady at about 1,200 positions. That means that Dr. Ence has to be one of the top 7 out of every 100 life science PhDs applying for a job as an independent researcher to get the position. In medical schools the numbers are worse. 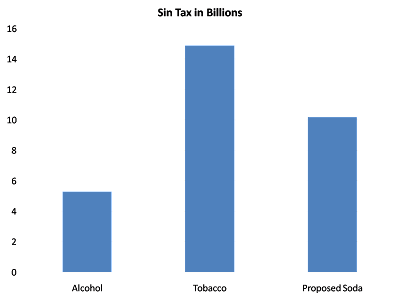 In the graph below, the blue bars represent the total number of medical school faculty members with a PhD and the red bars are the number of new faculty hires with a PhD in a given year. 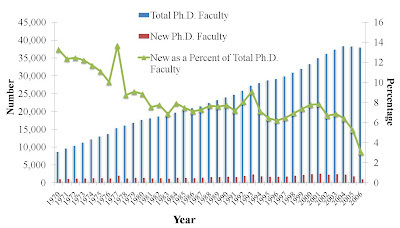 The green trend line represents the percentage of new hires when compared to the total number of faculty with a PhD. So, for example in 1970, the total number of PhD faculty in med schools* was about 8,800 and med schools hired about 1,100 new faculty with a PhD, which is about 13% of the total. 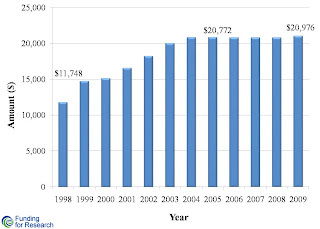 By 2006, the number of faculty with PhDs in med schools had increased to about 38,000. But, only about 1,100 new faculty were hired meaning a increase of about 3%. These are dismal numbers. Cy and others like him have an incredible battle before them. 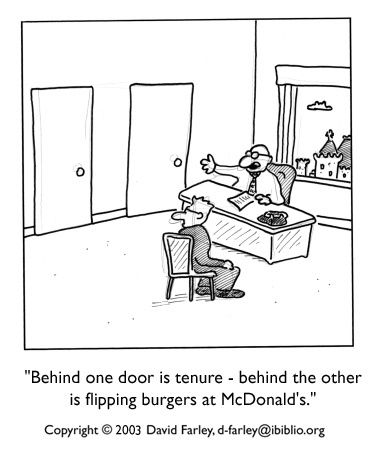 Why is it so difficult to get a faculty position? How did the competition get so steep? What happens after getting a faculty position? Is everything roses then? We'll explore these questions and more next week, as we continue our series on Human Capital and Knowledge-based Economy. *Medical schools certainly hire MDs, MD/PhDs and other graduate degree holders, but this just looks at PhD hires because it is the most reliable and readily available data. This is Part 4 of 6 in our Human Capital and Knowledge-based Economy series. Congratulations to New Voices guest bloggers Tyrone Spady and Pascale Quignon for being featured in Scientia Pro Publica #4! Their April 15th post On Dogs and Research discussed the genetic variation in man's best friend and how research in animals can improve human health as well. 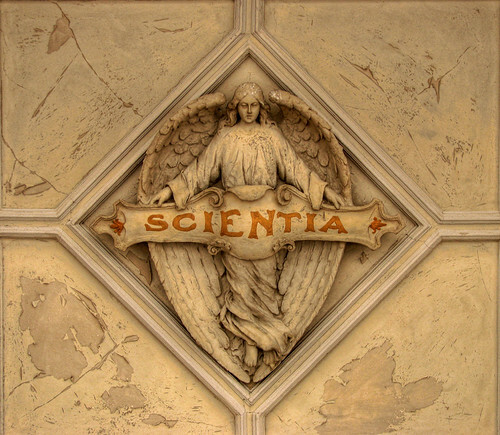 Scientia Pro Publica is a blog carnival that highlights the best science blogging written for the public. The carnival appears bi-weekly in the blogosphere and this fourth edition is being hosted by Eric Johnson at The Primate Diaries. Thank you to Eric for selecting Tyrone and Pascale and a special thanks to GrrlScientist* for getting this amazing carnival started. Go check out all the featured pieces! *If you love libraries, help GrrlScientist advocate for the New York Public Library. Welcome back to the Human Capital and Knowledge-based Economy series. As I mentioned in previous posts, the economy is changing and ideas and innovation are drivers of the knowledge-based economy. Hence, researchers are one of the bases of the economic infrastructure. I've examine what it takes to train a researcher- the investment needed both financial and in terms of time and I wanted to focus on life scientists. To become a researcher today one can take many routes, and the options are ever increasing. To make things easier lets follow the journey of Cy Ence. He's about to finish his first year in kindergarten, and though he doesn't know it yet, he has just taken his first step on his path towards becoming an independent researcher. Like many who'll enter the life sciences, Cy will eventually want to become an independent academic researcher* (a principal investigator or PI) so he can spend his days working in his own lab at a university. But that's a long time from now. Right now, he's looking forward to a summer of catching tadpoles and we're going to look at how much time and money it's going to take to get Cy from Hometown Elementary to his dream job. All of this will be based on using the most recent numbers available and assuming that nothing changes in the next 30 some-odd years. The Department of Education charts the average cost per student per school year across the U.S. They have been maintaining their records going back to the early 1900s. I've started in the late 70s- a time when some of you (and many of today's young researchers) started school. In the late 70's, the average investment per child per school year was $1,855. Today, that figure stands at $8,701. These are just the directly measurable costs meaning, teacher's salaries, school lunches, books etc., so the actual number is a lot higher. 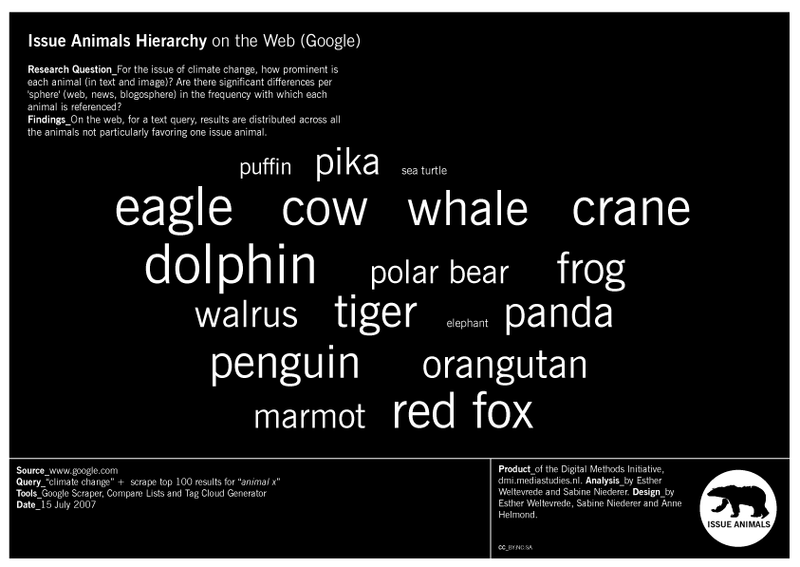 But, for simplicity's sake, we'll stick with the smaller and more easily obtainable data. So the investment in young Cy (@ $8,701 / year - if nothing changes) - will be about $113,000. After he graduates high school, Cy will be heading off to Average American University. 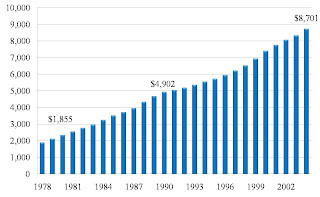 As the graph shows, the investment in room, board and tuition alone per student per year of college across the U.S (both public and private schools) was $7,452 in the early 90's. Today, that figure is about $14,629. This of course, does not take into account all the other expenses associated with college - books, transportation, beer and the like. For Cy - the minimum investment will probably be about $58,000 and 4 years. Since Cy Ence, B.S. will not be enough for our favorite student, he's going to head off to another university to work towards his PhD. Assuming it takes him the median seven years*** to finish his doctoral degree, the total investment for his graduate stipend will be about $145,000. This is not accounting for the reagents he uses for his experiments, his animals etc. Now it is officially Dr. Cy Ence and he is well on his way to becoming an independent academic researcher. In the life sciences, there is often one more step: post-doctoral training. Post-docs can range from two to seven years and it is becoming common to do more than one post-doc. Since Cy Ence, PhD is the average American researcher, he is not going to immediately find a permanent academic position. Instead, he is going to follow his first (short) post-doc with a much longer one. When he is finally done being a student (29 years from now), the minimum investment in his education and training will be about $633,000 dollars. That's right. 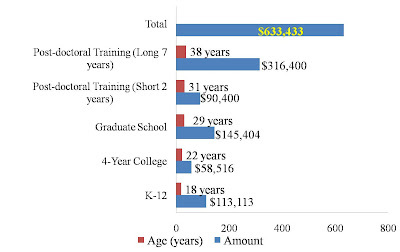 Training a single independent researcher requires a minimum investment of $630 thousand dollars and over 30 years. We'll continue following Cy and discuss what the future holds for him as we continue our series on Wednesday with a look at the competition for academic positions and how independent researchers are funded. *Independent researchers can be employed in many sectors - Academia, Industry, Government etc. I have chosen to focus on Academia because, our current graduate curricula are largely structured to train Academic researchers. **This is the most common path today, but by no means the only path taken to become a researcher ;some people go to community college first or work towards Masters, Medical, or Veterinary degrees, etc. before becoming researchers. *** According to NSF, the median time for graduating with a PhD in the life sciences today is 7 years. Sources: Department of Education, National Center for Education Statistics, National Institutes of Health (NIH)/Office of Extramural Research (OER), National Research Service Award (NRSA), National Science Foundation (NSF)/Division of Science Resources Statistics (SRS). This is Part 3 of 6 in our Human Capital and Knowledge-based Economy series. Tomorrow is Armed Forces Day. So today, in honor of our military, we'll be discussing health research done through the Department of Veteran's Affairs (VA). 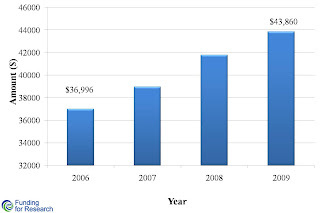 In 2007, the VA received about $819 million dollars for medical and prosthetic research - 2.1% of total government health research expenditures and two-thirds of one percent of estimated U.S. health research expenditures. Some of America's greatest medical achievements were brought about through research done by the Department of Veteran's Affairs. The list goes on and on. This research, initiated to help improve the lives of soldiers and veterans has helped countless other Americans as well. As you see members of our armed forces this weekend, thank them for their service. Their service overseas and here at home protects our country and improves our health. If you've heard it once, you've heard it a thousand times: choose your words wisely. This general rule of communication applies to everything from talking to friends and family to drafting a journal article. Working as an advocate (and a blogger) means that my words have to be chosen precisely. This doesn't mean that I spend hours poring over posts before sharing them with the world, but all of us here at New Voices make a considerable effort to pick clear, concise, meaningful words that enhance our posts. And in advocacy, having a simple, memorable message is worth the time it takes to develop it. "...Doctor and patient do not speak the same language. They speak Latin. We speak Reader's Digest." You probably don't need to message test everything you want to say before you say it, but it is good to remember that the words you share may not always have the effect you intend them to. In my last post, I talked about how we are moving towards a knowledge-based economy and what that term means. 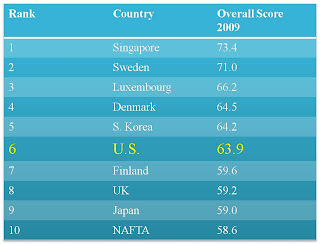 In today's post, I want to talk about U.S competitiveness, especially with respect to a knowledge-based economy. 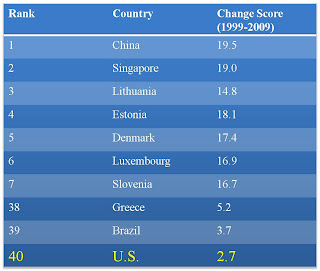 Several reports about U.S. competitiveness and innovation in the global economy have been compiled. Although they all use slightly different methodologies, they all reach the same basic conclusion. We are not doing enough to spur research and innovation and we need to wake up before its too late. The latest report is from ITIF an independent think-tank, here in DC. ITIF specifically focused on the science and technology (S&T) sector, so I'll give some details from their report- The Atlantic Century, which uses 16 different parameters like innovation, productivity, S&T policy, trade policy, etc. to grade and rank 40 different countries on how innovative and competitive they are. Table 1: How innovative and competitive are we? Out of 40 countries, we came in 6th. Perhaps, not time to push the panic button yet, but far from the magical #1 slot that most people believe we enjoy. The report goes further and examines what these 40 countries have been doing to actively encourage innovation and competition in their countries over the past decade. Table 2: Has our score improved? This is the most striking result of their analysis- we came in dead last. Out of the 40 countries they studied: the U.S was doing the LEAST to spur innovation. The results are particularly distressing because countries like Singapore and Luxembourg - already ranked higher than us in innovation and competition - are also doing more than us (a lot more) to spur innovation, meaning we'll have much farther to go to catch up. The cornerstone for the future of U.S. competitiveness and innovation lies in supporting our research infrastructure, and more specifically researchers. In my next post, I'll discuss the most common path to becoming a scientific researcher in the U.S. and the time and financial investment it requires. This is Part 2 of 6 in our Human Capital and Knowledge-based Economy series. The Chicago skyline from a boat on Lake Michigan, as captured by christopherdale. The posts in our climate change and health series have been discussing the range of consequences climate change may have on human health. Increased precipitation could cause flooding & lead to water supply contamination, spreading water-borne diseases such as cholera & parasitic illnesses. A report published in the American Journal of Preventive Medicine in October 2008 predicts increased risk for water-borne illness around the Great Lakes, potentially affecting 40 million people, due to an increase in climate-related extreme rainfall that could overwhelm storm water and sewage systems, potentially diverting raw sewage to Lake Michigan - a key source of drinking water. While some regions will be effected by extreme precipitation, others will experience drought. These drier conditions can also spread water-borne illness as a single infected source could be shared by more people than usual. This is Part 6 of 7 in our Climate Change and Health series. I hope everyone had a happy Mother's day yesterday. 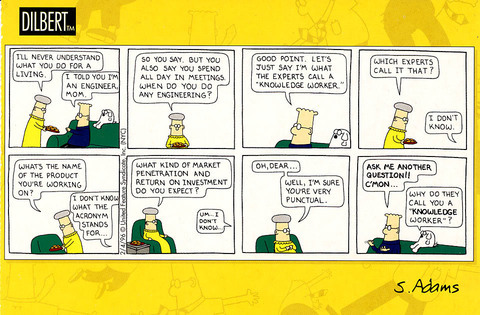 Like Dilbert's mom, the first time I tried explaining what I did to my mom, she was more concerned about how I'd be making any money as a scientist than with understanding my research. Now that I am a policy fellow, the value of my work may be even more difficult to measure. A knowledge-based economy is exactly that, an economy based on knowledge and the products of knowledge. So, I've been working on how to increase our workforce (a.k.a people) for a knowledge-based economy (a.k.a the world we live in now). This is an issue that has fascinated me for some time now, so I was ecstatic when the good folks at Research!America said that I could work on it. Why is this issue important? For me (and many of you), it is important because I am a scientist, and this issue directly impacts my workforce. It is also important in the larger context of our economy. Pretty much everyone now realizes that the days of a manufacturing-based economy are over. We are moving towards a knowledge-based economy . We are moving from jobs that largely require manual skills (like assembly line jobs) to jobs that require intellectual skills (like doing research). Our economy is now trading in goods that are more the product of the mind than the hand (eg. trading in fuel-cell technology has more value than selling a car). We are also a mature economy and the jobs that promise to stay in America are not the manufacturing jobs but rather the intellectual jobs. The rise of inexpensive and reliable telecommunications and transport has led to the export of jobs requiring intensive input of manual labor and a demand for jobs requiring input of intellectual skills. In other words, a company that trades its products globally is minimizing its manufacturing costs by shipping those jobs overseas, while keeping its R&D facilities - and thus those jobs - here in the US. So, if we are moving to an economy where intellectual skills and research are going to be valuable, don't we need a trained workforce? Do we need more people who can do research? If so, how will we train these individuals? How much will we need to invest and how long will it take? I'll be exploring these and other questions over the next few weeks throughout a series of posts on building human capital in a knowledge-based economy. Stay tuned! This is Part 1 of 6 in our Human Capital and Knowledge-based Economy series. In honor of Mother's Day, we've pulled together links to some of our favorite blogs written by mothers. We hope you'll enjoy their great posts on science, society, academia, research, and of course, motherhood. Please help us add to this list. Maria Gracie of Get Organized Now! The BlogHer network has lots of great blogs written by moms. And last but not least, Dr. Isis of On becoming a Domestic and Laboratory Goddess. We'll be talking more about her Letters to our Daughters project soon. Happy Mother's Day - and don't forget to call your mom! **Special Mother's Day good wishes to New Voices co-blogger Emily Connelly who is celebrating her first full year as a mom in 2009! Last week I was on vacation with my family. Our trip included stops in a couple of Caribbean locations, including Cozumel, Mexico. Well, it was supposed to anyway. The day before we were scheduled to land in Mexico, the CDC issued a strong warning against non-essential travel to Mexico, which led our cruise line to re-route us to a day at sea. We were mostly cut off from news sources aside from our daily cruise bulletin about where to find trivia, bingo, or pool volleyball, so almost no one knew the actual symptoms of swine flu (fever, body aches, runny nose, and other basic flu symptoms). Upon returning home to the U.S. the news was plastered with outbreak stories and updates on places cases had been reported. Of course, precaution and prevention are excellent tools to improving human health. But, the stress and alarm produced in an otherwise healthy climate could not have had a positive psychological effect. As professionals in science and health, we can often be the "go-to" person when issues like swine flu appear in the media. There are a few things we can do to help diminish the panic that often accompanies startling science or health news. Explain what you know. To be honest, I knew almost nothing about swine flu when the whole situation started, so I kept to myself. As I could, I read up on it, how it spread, and where reported cases were and only then talked about it to others. Refer to the experts. The CDC, flu researchers, medical doctors, and other experts are the best sources of information. To keep hype to a minimum, refer people to websites and experts who are relaying facts in the least sensational manner. Lead by example. Absolutely be cautious yourself and wash your hands more frequently (note this isn't the same as sanitizing) or do whatever is best in the scenario. 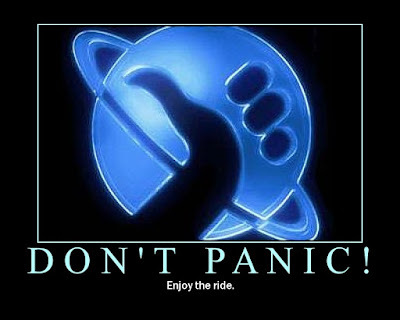 However, try not to instigate panic by being panicked yourself. It doesn't seem like much, but just being calm, cool, and collected can make a huge difference. Any other suggestions or swine flu related stories to share? Your voice is needed. NIH is requesting feedback from the public on new guidelines for federal funding of embryonic stem cell research, and significant opposition is expected. President Obama's March 9 Executive Order lifted the Bush Administration's restrictions on embryonic stem cell research and instructed the NIH to develop guidelines for federal funding. Please submit your comments on the guidelines by May 26 to show your support for federal funding of stem cell research - NIH will be considering both the content and the volume of the comments received. We have provided sample comment text below that any advocate can submit to NIH. However, we encourage you to modify the comments based on your reasons for supporting stem cell research or expertise you may have in the field. To review the guidelines before you submit your comment, go to: http://stemcells.nih.gov/policy/2009draft. Copy and paste the text below into the comment box, edit as appropriate, and submit your comments. It is important for the federal government to support all types of stem cell research. Our nation's leadership in health-related research depends upon such funding, as does the health of its citizens. A majority of Americans (73%) favor federal funding for embryonic stem cell research according to a Research!America poll. The final guidelines for federal funding of embryonic stem cell research must ensure that science can progress to the fullest extent possible. I am pleased that the draft guidelines would expand the number of embryonic stem cell lines that are eligible for federal funding. However, the final guidelines should allow federal funding of all avenues of stem cell research. Specifically, the guidelines must ensure that any line that is currently eligible for funding should remain eligible so that research underway is not halted. It is also important for the guidelines to support funding of research on stem cell lines derived from somatic cell nuclear transfer. The NIH should continue to monitor developments in the field and to update these guidelines as the research progresses. Bob Woodruff, known to most of the world as the ABC News reporter who suffered a devastating injury in Iraq, is also an active advocate for research into head and brain injuries. He and his wife, fellow journalist Lee Woodruff, founded the Bob Woodruff Foundation dedicated to helping heal the physical and psychological wounds of war. Woodruff grew up in middle America and earned a law degree from the University of Michigan. He is fluent in German and Mandarin besides of course, his native English. His break as a journalist actually came because of a chance happening: he was in Beijing teaching law in1989 when the Tianenmen Square incident happened. CBS News hired him as an on-screen interpreter during the incident. This marked the turning point in his career and he decided to become a full time journalist eventually joining Peter Jennings as co-anchor of ABC's World News Tonight. has received much media attention. During his long stay in hospital he leaned on his family and especially his wife, Lee. Lee and Bob wrote candidly about their experiences in the bestselling book, In an Instant. mental and psychological trauma gets less attention than physical trauma. Thus, his foundation works to promote research on all three fronts -physical, mental and psychological. This Mental Health Month, we salute Bob and Lee Woodruff for their continuing advocacy for research to improve health. 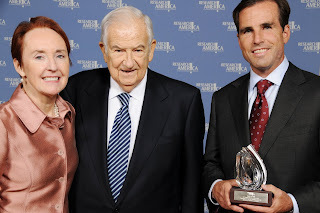 Research!America President Mary Woolley, Isadore Rosenfeld, MD and Bob Woodruff at the Research!America Advocacy Awards dinner, 2009. Last week I attended a panel discussion at the AAAS Forum on Science and Technology Policy called Climate, Energy, and Health: Policy Implications. The speakers discussed the intersection of these three big issues, and nearly all of them spoke about climate change’s likely increase in malaria incidence (validating my project!). 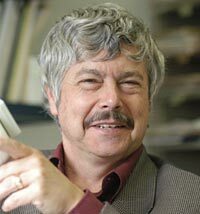 Andrew Dobson, Professor of Ecology and Evolutionary Biology at Princeton University, spoke about the role of climate change for infectious diseases. He strongly suggested that vaccines won’t work for diseases like malaria and cholera because immunity builds too quickly, and risk groups would need to be vaccinated every year, which is not a practical long-term solution. To make the disease seem more real, Dobson told the group that malaria is like one 9/11 every day, killing roughly 3,000 children per day in Africa. Studies tracking mosquitoes have shown that 99% of their bites are on cows, somewhat limiting the spread of malaria and that many ticks bite squirrels, somewhat limiting the spread of West Nile Virus. Therefore, higher biodiversity leads to lower vector-borne disease transmission rates. As diseases move out of the tropics there will be a less attractive variety of hosts (animals, etc. ), so they will focus on humans. 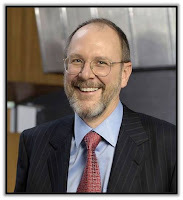 Dan Greenbaum, president of the Health Effects Institute, discussed how climate change is going to affect ozone, making a difficult current public health problem more challenging. Ozone causes health problems such as inflammation in the respiratory tract, increased hospitalizations for asthma, and lung disease. Projections suggest significant effects will start to be noticeable in 2050 but we can take action before that to mitigate effects. Carlos Covalan, senior advisor in Sustainable Development and Environmental Health at PAHO-Brazil, spoke about how 3 billion people use solid fuels, such as wood and biomass, in poor countries for basic energy needs like cooking and heating, significantly contributing to the climate change by producing emissions and particulate matter. He put the issue in perspective by saying: Our energy burden is to pay a bill once a month. Their burden is (for mostly women) to carry huge amounts of wood on their backs 1-2 times per week for fuel. Reid Detchon, executive director of Energy and Climate at the UN Foundation made the case for why toxic aromatics, like benzene, should be taken out of gasoline. Aromatics replaced lead to provide octane, but could be replaced by biofuels which are potentially low in GHGs and have less negative health effects. Click here for more about the panel sessions held at the AAAS forum. Over the past two weeks you've read about a number of health implications of climate change, from cardiovascular and respiratory issues exacerbated by heat to vector-borne diseases like malaria and Lyme disease. Today, we continue the series with a look at the mental health effects of climate change. Extreme weather events, sustained droughts, flooding, and changes in traditional food sources are incredibly stressful and many people may choose (or be forced) to leave their homes. Climate change refugees will not only have to deal with displacement but potentially the emotional stress of losing friends and family. Poor mental health can reduce productivity and increase unrest. Additionally, declining mental health can result in increases in injury and suicide. In the short years following Hurricane Katrina (certainly an example of extreme weather, if not evidence of climate change), suicide rates tripled. May is Mental Health Month, and here at New Voices we’re going to be posting throughout the month about the importance of mental health research, advocacy opportunities, and profiling leaders in mental health advocacy. For an introduction to Mental Health Month, we recommend seeing the experts over at Mental Health America; they have some great features including a website dedicated to living well. *Patz, J.A. Defining the current and future health risks of climate change. Program and abstracts of the American Public Health Association 135th Annual Meeting; November 6, 2007; Washington, DC. Presentation 4077.2. This is Part 5 of 7 in our Climate Change and Health series.